Below you can view all the condos for sale in the The Meridian subdivision located in Mount Pleasant South Carolina. Listings in The Meridian are updated daily from data we receive from the Charleston multiple listing service. To learn more about any of these condos or to receive custom notifications when a new property is listed for sale in The Meridian, give us a call at 843-547-5049. 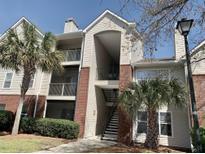 Do not miss out on this chance to own a ground floor condo with a CARPORT spot close to your front door! MLS#19008079. Agentowned Premiere Group. Come see this home today--it won't last long! MLS#19007545. Atlantic Properties. Tenant will be vacating April 19. MLS#19007526. Horne Realty, Llc. This is a beautiful condo in a beautiful spot! MLS#19007461. Matt O'Neill Real Estate. Also last year all new plumbing for the washer, sinks and showers. MLS#19007250. Coldwell Banker Residential Brokerage. You can't get much closer to all the action too with great shopping, dining, the beach and downtown Charleston all so close by! MLS#19005966. Matt O'Neill Real Estate. Get the highly desirable first floor while it's available! MLS#19003101. Coldwell Banker Residential Brokerage. ** We are proud to present this (2) bedroom, (2) full bath, MLS#19002597. Fred Holland Realty. The Meridian has beautiful lagoons, walking path, car wash and boat parking area and MLS#18024588. The Boulevard Company, Llc. The Meridian offers beautiful scenery, several amenities including pool, tennis courts, and fitness center as well as convenience, only minutes away from dozens of shops, restaurants and the IOP beach! MLS#18023547. Hayden Jennings Properties. Showings are By Appointment ONLY and a 24 hour notice is required. MLS#17015877. Hipp Properties.